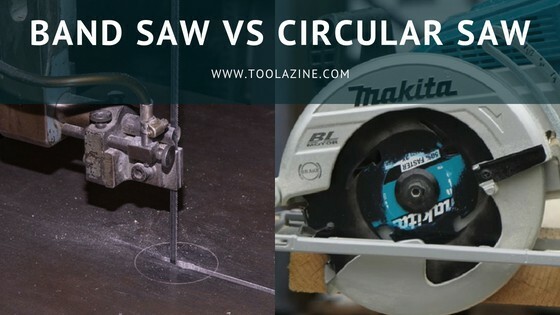 Toolazine Band saw vs circular saw: What is the difference and what should you buy first? Band saw vs circular saw: What is the difference and what should you buy first? A key question that most people ask when they are beginning woodworking is what the difference between a band saw vs circular saw and which one should they buy first. Both saws are very different. A band saw is primarily used for curved cuts and cutting irregular shapes in wood. A circular saw is primarily used for straight cuts, both long cuts along wood (rip cuts) and short cuts across wood (crosscuts). Let’s look into these two saws in more detail. A band saw has an important role in the garage of every woodworker, but so does the circular saw. Both tools are irreplaceable, as each of them has specific features and is used for different tasks. Ever wondered which one is better? Can one substitute the other? When do you use a band saw, and when a circular saw? All of these questions may confuse you, but if you carefully go through this article you will have no issues – as I will try to cover everything you need to know. In case you desperately need a new tool, here are the models you need to consider. What is a band saw? What is a Band saw used for? First of all, let’s define both tools. A band saw is a large, fixed and very powerful machine that can be used for a range of different activities. It is run by an electric motor and the blade has teeth only on one side. The blade is driving in the direction of the table, which increases the safety when operating with it. Fast cutting and extremely precise cuts – this is heaven for every woodworker, so don’t get confused when you hear that a band saw is someone’s main tool. Depending on your needs, you can easily adjust the tool, change the width or replace the blade considering the material you are going to cut. The following video should be more than enough to help you get to know this tool. Unlike the band saw, a circular saw is a handheld tool, great for hobbyists and professionals. It is made of a round blade that has sharp teeth on it, that spins thanks to the powerful motor. Circular saws are again, very adjustable tools– the operator is the one who decides what is the depth and height of the cut. What do you need to know about a circular saw? This video will provide you with the basic information. Whether you are left or right-handed, circular saw come in both versions. However, even if you are left-handed, many woodworking gurus will suggest you go with a right-handed model, as you will have better visibility over the material you are about to cut. Do you need curved cuts or straight cuts? The answer will guide you to the right machine. I already introduced you to this tool, but for what activities can you use a band saw? Curved cuts. If your intention is to cut curves and other irregular shapes, then this tool should be your choice. Apart from this, a band saw can be used as a substitute for a table saw. It can rip lumber and make crosscuts with zero chance of kickback. Adjusting the upper guides make it easier to cut thick wood and you can use the band saw for resawing or cutting the wood through its thickness. However, this tool is not only limited to wood cutting. If you set up the right blade, you could deal with plastics and many metals. Need more info about band saws? Check out: Band saw vs table saw. See my review of the best band saws on a budget. Can you cut curves with a circular saw? Unfortunately, no, because a circular saw is designed for straight cuts. These are all types of cuts that you can make, but for what you can use them? Circular saws are mostly used for heavy-duty tasks that include long, fine and smooth cuts, like building furniture for example. A circular saw has a bigger blade which can be used for cutting plywood, sheetrock and framing materials. In addition to this, a circular saw is also great with other materials like masonry and plastic. Grab a circular saw, learn the straight cut and you will be able to build whatever you like. If you ever wanted to make a bookshelf, now is the right time. In this section, you can find the best tools according to your budget. This beast is designed for professionals that need a quality tool to handle their needs. Once you have set the right blade, you can cut through wood, plastic, and many metals. The Grizzly GO555 is very durable and easy to use. It has a robbyst frame, which makes it heavier, but that is good as it makes the tool more stable. Believe it or not, this tool doesn’t have a LED light. It is a disadvantage, but that could be easily solved. Check the latest price for the Grizzly GO555 here on Amazon. It may not cut as quick as the previous model, but it will get the job done with great quality. The Rikon 10-305 is an affordable tool that you need to consider. It has a motor of 3.5 Amps, which is just enough not for the typical hobbyist, but also for a workshop owner. This machine will give you quality cuts and it is easy to use. Not only that there is no LED light, you won’t get a miter gauge as well. However, for the price you can get it, it is durable and reliable model. Check the current price for the Rikon 10-305 here on Amazon. Not enough? Check more band saw reviews. Smaller tool means less weight and easier operation. And what more do you need as a typical homeowner? Although small, it is very powerful – it has a 5.8 Amps motor that spins up to 3500 RPM, so operating with this tool is very easy and convenient. It has a dust port to keep the cutting area clean from debris and with the right blade you can cut through wood, but other materials as well. Plus, the Genesis GSC545C is compatible with many blades. Check the latest price for the Genesis GSC545C here on Amazon. When making straight cuts, precision is crucial. And with this Makita model, you can be sure that you will get extremely accurate cuts. It is rail-guided circular saw, and there isn’t another technology that could offer better precision. Combine that with a powerful motor of 12 Amps and you can make smooth cuts very quickly. You can change speeds with the variable speed trigger and cut really thick materials. Check the current price for the Makita SP6000J1 here on Amazon. Didn’t find your favorite? See more circular saw reviews. Band saw or circular saw? Well, both are great tools, the thing that really matters is what kind of cut do you need. If you need a curved cut, a band saw should be your pick. However, if your activities require straight cutting, your main choice must be the circular saw. What is your choice? Which one do you prefer and why? Leave a comment in the comment section below.